Wakefield! Furbush! How can we not keep an in running Red Sox diary? With the Sox keeping a short nose ahead of the Yankees, Red Sox stalwart and all round good guy Timmy Wakefield goes for his 200th win in a Red Sox uniform. Enough with the chit chat. Let's see what happens. So, last time out, the hilariously named Furbush gave up just the 7 runs. 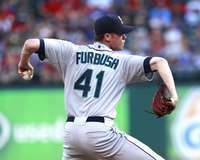 Furbush was pitching for Detroit earlier this season, at least now in Seattle he gets to start every week. Until those 7 run outings pile up, that is. Furbush starts the game with a ball inside. All things considered, what's the over/under for innings pitched for Mr Furry Bush today? 3.5? 4? I'm going under 4. Of course, naturally, he comes back to strike out Ellsbury. Tough enough matchup for Jacoby, however, seeing as Mr Furrybush is a lefty. Pedroia rolls one out to short and is out after a nice play by the Seattle first baseman, Haddock, or, Carp. Tito comes out to argue that the latter's foot came off the bag, which it appears it did. I'm all on for venting, but, really, what's the point. To my mind, I have never seen a call reversed. Ever. Ever. So, managers, do yourself a favour, just take a deep breath and let it go. Gonzo grounds out to Trout, and the top of the first is done, in the books, over. Ichiro, batting lead off for Seattle, has to be one of the greatest wasted talents in MLB history. Before you Seattle fans out there start banging angrily on your keyboards, come on. The Mariners are, and have been for a long time, terrifically awful. Splendidly brutal. Imagine Ichiro at the top of a decent order. Ouch-ee-waa-waa! That boy would have scored a lot of runs, and won a couple of MVP awards too, I would wager. Instead, he is top of one of the most inept orders in all of baseball. That's crazy, Wakefield has never won at Safeco Field. Hard to believe. Well, you have to like his chances tonight. Quick one, two, three inning, and we go merrily to the top of the second. Youk! Is it just me or is Youk swinging at bad pitches, outside the zone, more so than ever before? On cue he swings and misses at a very mediocre high and outside fastball. A pitch I just can't help thinking he was ignoring in seasons past. Big Papi's shades look like something from Tron. If batters are allowed wear shades, why can't pitchers do same? Papi strikes out looking on a very mundane looking fastball on the outside corner. Furrybush's inning over/under has increased to 5.5. Right now the seemingly sleepy Sox are making him look like Cliff Lee. Jed Lowrie is batting .370 against left handed pitching. Tasty. However, make that .369, as he ground out to third. Half inning over. Oh boy, a promo on NESN for the Liverpool v Sunderland match, airing tomorrow on NESN. The game itself was played Saturday, yesterday afternoon. Jerry Remy actually mentions this, and I imagine Don Orsillo was waving at him frantically to not give the score away (Excellent result for Sunderland, 1-1). As a lifelong Sunderland fan, thoroughly enjoyed that one, and if you are in Boston, do yourself a favour and check out Sunderland's Seb Larsson's spectacular equalising goal. Meanwhile, the Mariners, including former Sox bopper Wily Mo Pena, go very, very quietly in order, undo, dos, tres. Inning over. Jerry and Don are talking about flowers. Personally, I like them, they are easy to listen to, informative, and fun. I think the general consensus amongst Boston fans is that the jovial duo do a good job, however I would be interested to know what other baseball fans think of them. Carl Crawford becomes the games first base runner with a patient walk. Not a good plan, Mr Furrybush, walking Crawford to lead off an inning. Let's see if he steals. You know, I haven't decided yet what I think about The Sports Guy, Bill Simmons's latest project, Grantland, but I loved his amalgamation of Varitek and Saltalamachia into one single name, for catchers batting statistics. Varimachia. Thumbs up to that one. Sadly Varimachia strikes out looking. Crawford remains glued to first. Perhaps he is just timing Furrybush, who has an almost Bronson Arroyo like full leg kick, it's that high. Furrybush is throwing 89/90. Hard to understand how so many Red Sox batters are just watching it slide on by for a strike. His stuff is anything but over powering. The home plate umpire isn't even giving him anything special. So far it's just a lacklustre Sox showing. Crawford steals second as McDonald strikes out on a pitch low and way, way outside. What are these guys swinging at?! Furrybush has 5 more strikeouts than he should have (0!). Ellsbury rolls over on a flat fastball and grounds out weakly to second. Do the Red Sox have somewhere to be this evening? Zeroes all the way across the board thus far. Casper 'The friendly ghost' Wells makes it on via the walk, and then makes it all the way to third, when Varimachia's throw to second sails into center field. Wells scores on Wilson's single. Just like that, the weakest lineup in all of baseball (yes, worse than Houston) takes a 1-0 lead. Have you ever heard of Kyle Seager before? Nuh-uh? Neither have I. Well, he slams a single to right, and Seattle have runners on first and second. no out. This could spiral out of control in a heart beat if Wakefield doesn't start getting some swings and misses. Some sloppy defence, and Seattle suddenly have the bases loaded, no outs. Tito pops out of the dugout to argue again, Tito! Do yourself a favour, don't bother!! No call has ever, ever been altered after an argument. Never gonna happen, Tito!! One quick sacrifice-fly later and it's 2-0 Seattle. You wonder what kind of a length of leash Wakefield is on tonight, you know, seeing that he is chasing his...you know the rest. Lots of Red Sox fans in the crowd. For all the bluster at Seahawks games, the Mariners crowd is pretty quiet really. Aren't Seattle fans supposed to be outrageously loud? A walk and a single and suddenly it's 3-0. Matt Haddock Trout Carp knocks in the third. The bases are still loaded, and there is just the one out. Can Wakefield make it out of the inning alive? Old friend Willy Mo Pena's at bat will have a lot to say about that. The big guy helps his old buddy out, popping up limply for Gonzo on first. Two away. Some of these Mariner averages are just horrendous. Miguel Olivo, sporting his .216 average grounds out weakly, and the inning is over. Yes, I know, I absolutely hexed the Sox with that prediction of an early night for Mr Furrybush. Pedroia lines out to short, after which Gonzo breaks up the burgeoning no-no with a hard long drive to right. Just hearing Dan Uggla's 33 game hitting streak is over. Joe Dimaggio can rest easy. To non baseball fans, that 56 game streak of DiMaggio's is just a bunch of numbers. To most baseball fans, it might be the single most unbreakable sporting record around. 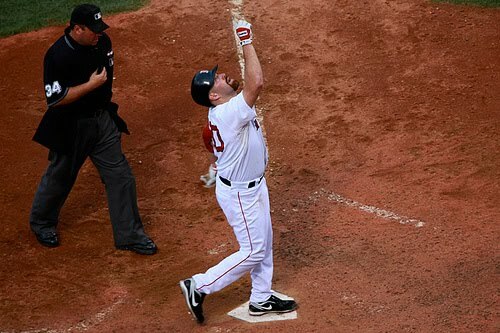 Youkilis walks, and the Sox are in danger of stepping into a little rally action. Ortiz bats without the Tron shades, and that appears to do the trick, as the big guy flares a single into center field. Stupid shades! Bases loaded, only one out. Gonzo may be slow, but he runs with a determined look on his face, doesn't he? Sprinting home from third on a sac fly by Lowrie, Gonzo looks like he is chasing after someone who just stole his wallet. Crawford pops up and, well, at least Boston are on the board. Mentions of Wakefield's quest for 200: Do I even have to tell you? Still just the 2. Furrybush gets two very quick outs and then slaps Ellsbury on the backside with a 27 mph curve ball, that does not curve. Pedroia provides a giant tease with a long fly ball that, ultimately, is just the final out of the top of the fifth. This game is just zinging by. Here come Seattle. The top of the order goes, by their standards, nuts, with single, single, single greeting Wakefield to open the bottom of the sixth. I have to ask, how on earth is there no one warming up in the Red Sox bullpen? Of course, as soon as I finish typing that, they cut to Aceves, getting loose. Wakefield gets an out, and there's runners on first and second with one away. Eventually Wily Mo Pena will step into one and hit it 500 feet or thereabouts. Not this time though. He grounds out weakly and there's two away. Olivo strikes out, and the Mariners have to be content with just the one additional run. Furrybush throws what looks like a 75mph 'fast'ball, followed by a looping curve that Gonzo slaps into left for a lead off single. Ichiro makes a splendid play on a Youkilis fly ball. Gosh he's good. He has everything you could want from an outfielder. Once again though, sad as it is to say it, what a singularly 'lost' career, results wise, anyway. Ortiz grounds into a double play, and Boston is in danger of losing a series to the weakest hitting team in major league baseball. Casper The Friendly Ghost Wells absolutely whales on a Wakefield flutter-ball and slams it a billion miles to left for a solo shot. Seattle have five runs too many. I will be stunned if Wakefield comes out to pitch the seventh, you know, assuming Boston wants a win here. To his credit, Wakefield knuckles down (Get it?!) and gets out of the inning without further damage. For me, the Sox have not made Furrybush work hard enough in this outing thus far. They are swinging at some really terrible pitches. Lowrie shuts me up by slapping a goofy little seeing-eye single to left to start the top of the seventh. Did you know Boston plays Tampa after this? Doesn't that make tonight's game even more important? Imagine facing Tampa on the back of a 1-2 weekend against this brutally bad Seattle lineup? The Tampa series starts with a double dip on Tuesday. Lester and Bedard, in case you are wondering. Another tease! McDonald wallops a fastball deep to center field, and ends up with nothing to show for it than the end of the top of the inning. This is slipping away fast from Boston. Dan Wheeler up in the pen. Meanwhile, Wakefield is still on the hill. Remy calls one of his pitches 'a slower version of the knuckle ball'. Wait, what? Slower? Wily Mo! Not quite, 'I told ya', but, almost, as the big guy slams a line drive double to left. The Mariners strand him there though, and we're through seven innings in just under two hours. Who said baseball games are too long?! Furrybush out, Bill Gray in. You have to tip your cap to young Furrybush, he pitched fearlessly today, throwing strikes and keeping a rhythm going. Holy tamolé Timmothy Hutton has gotten faaaaaaat. I know this because NESN shows him on the big screen, enjoying the game, in a flopsy, old looking Red Sox cap. He wears it jauntily sloping to the right. Good for him. There are two away faster than A-Rod can say 'Can I check?' after the player to his right has already raised. With a runner on, Youkilis steps into a pitch and launches it to left, Just like that, 5-3 Seattle. That, at least, makes the ninth interesting. Frankly, I am stunned Wakefield is still on the hill. I am completely aware he is chasing that target of 200 Red Sox wins in his excellent career, however Boston has to keep Seattle off the board here to have any chance of a come back in the ninth. Don't get me wrong, I want Wakefield to succeed, but with a day off for Boston tomorrow, I do not understand why Papelbon isn't pitching, right here, right now. Or at least Bard. There is, however, nothing more pointless than second guessing MLB managers, so I'll shut up. Besides, Wakefield just got through the half inning! One, two, three, inning over. In comes Brandon League, former Blue Jay. Lowrie strikes out feebly. Is it just me or do Boston need badly a signature win this season? The 10-2 record over New York is all well and good, but remember that ridiculous come back, back in 2003 I think, against the Phillies? Trot Nixon was involved. They need a signature come back, from the dead, win I reckon, just to give their second half some serious 'Ooomph'. Doesn't look likely tonight, however, with Crawford striking out, more feebly than Lowrie. Nice catch in center, game over, Seattle takes two out of three from Boston. Tonight feels like a lost opportunity, and the AL East is not going to win itself. Boston needs to start winning a few of these types of games. And, fast. Goodnight.